In May 2016, a wounded male bald eagle was found on the side of a highway in Northern California. The bird was taken to a local California Department of Fish and Wildlife game warden, who delivered him to Shasta Wildlife Rescue (SWR) in Anderson, Calif. Knowing the eagle needed more care than they could provide, SWR transferred the eagle to the U.C. Davis veterinary hospital. There, the eagle was examined by the Companion Exotic Animal Medicine and Surgery Service. The eagle had fractures of both the left and right side of its jaw, with exposed bone of the right mandible; a hemorrhage in the left eye; puncture wounds on both feet; healing fracture of the left proximal humerus; air sacculitis (i.e., inflammation of air sacs); and puncture wounds over the left coxofemoral joint. The eagle was stabilized with fluid therapy and appropriate pain management, and antibiotic and antifungal therapy was initiated. While the exact cause of the wounds couldn’t be determined, they were consistent with trauma. The injuries appeared to have occurred several days before. Due to the severity of the lesions, it was thought that the eagle would not be able to be returned to the wild. Wildlife specialists thought to place him in an educational program in captivity instead. Surgery was performed on his lower jaw to repair the fracture on the right side. 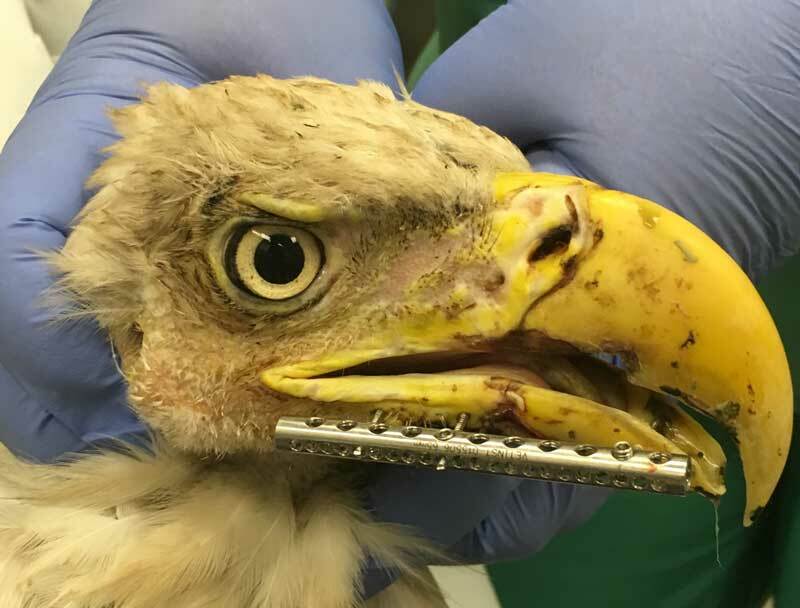 David Guzman, LV, MS, DECZM (Avian, Small Mammal), DACZM, and Noemie Summa, DVM, cleaned the wound, then placed pins through the bone on both sides of the fracture and connected the pins with a metal bar (i.e., fixator) adjacent to the eagle’s face. Such a system is designed to stabilize the fracture so the bone can heal faster. The fracture on the left mandible was determined to be stable enough that it did not require surgery. The fixator was adjusted to also align the slightly offset beak. Five days after surgery, veterinarians performed an endoscopy to look at the eagle’s air sacs and internal organs. They found plaques and increased vasculature consistent with air sacculitis, and a blood clot adhered to the air sac membrane. Biopsies of the plaques and blood clot revealed cells associated with and inflammatory process that was probably associated to the trauma. Six days after surgery, the eagle became increasingly stronger, struggled while being handled and bit at caretakers and items placed near it, such as stethoscopes, gloves and its hood. That day, he was found in his cage with the fixator and two of the three pins removed from his mandible. The right mandibular fracture was still healing, but there did not appear to be any additional damage to the bone or surrounding tissues. Since the fracture was still unstable, surgeons replaced the pins and fixator aligning the fracture fragments as much as possible to nearly proper occlusion of the mandible. After two weeks, the eagle was moved to UC Davis’ California Raptor Center (CRC) to continue medical management. The puncture wounds and abrasions on his face were healing well with daily cleaning. His right jaw fracture was still unstable, but he allowed the pins and fixator to remain in place this time. The fracture on the left side of his jaw was stable, but its ability to heal partially still depended on the stability of the right jaw fracture. Prognosis for healing was good as long as the fixator remained in place and provided jaw stability. It was still not determined at that point whether or not the eagle could be released back into the wild. It was determined, however, that he was a good candidate for captivity at the CRC, where several raptors are permanently housed for educational purposes due to their inability to survive in the wild. After two weeks at the CRC, the eagle’s weight continued to increase, as he was growing more stable and strong. His right and left mandibular fracture sites looked and palpated well-apposed, and the fixator was able to be removed. Shortly following this, the eagle was moved to a large flight cage at the CRC. There, he developed strength and flight abilities at his own pace throughout each day. Within three weeks, he was flying well in the cage, and handlers began conditioning the bird on the creance line as a means of evaluating his flight and also to further increase his strength and stamina. This was done daily for a week until mid-July. At that time, the veterinarians and handlers determined that the eagle was healthy and strong enough to return to the wild. CRC staff and volunteers transported the eagle back to where he was found in Northern California. His release was a success, as he immediately flew from his transport cage as soon as it was opened.